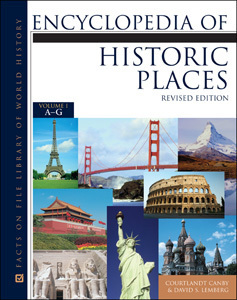 The three-volume Encyclopedia of Historic Places, Revised Edition identifies and provides fascinating background information on cities, towns, districts, territories, and nations around the world. With more than 9,000 A-to-Z entries and a full-color insert in each volume, this encyclopedia includes current place names as well as a substantial listing of ancient and classical places that are no longer in existence. There have been many changes in the geography of the world over the past 25 years, including the fall of the Berlin Wall, the collapse of the Soviet Union, and the birth of the European Union, to name a few. All of these changes, and many more, have been updated in this new edition to keep the information as current as possible. It includes entries from every region of the world, with an added emphasis on how industry and technology have changed the geography of the modern world. "...a must for all libraries." "...could be used in history and geography classes and for writing term papers and doing other research assignments." "This revised edition...has been well worth the effort...Highly recommended."